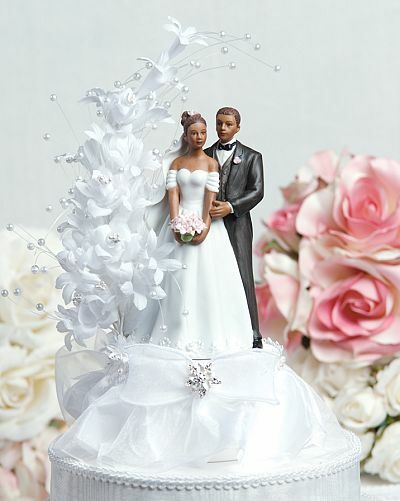 This beautiful cake topper features a white flower arch accented with faux pearls flowing over an elegant fine porcelain African-American wedding couple with the bride carrying a delicate handmade baby pink rose bouquet with matching roses in her hair, and the groom sporting a matching pink rose boutonniere. 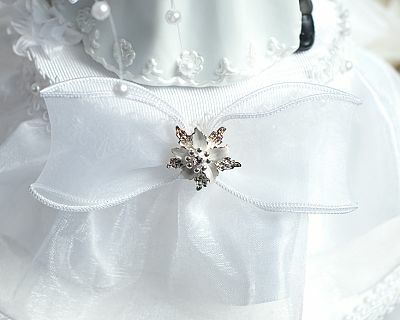 The front of the cake topper also features a flower ornament accented with white enamel. Skirt is made of organza. Handpainted porcelain. Perfect for a winter wedding!